So, you are finally ready to paint the project truck you bought two years ago. You have attended many car and truck shows during the past couple of years, and have seen what is possible. The problem now is that you want to replicate one of the awesome paint jobs you’ve seen, but you are not an expert spray painter. What to do? Your truck is twice the size of your mid-sized sedan, so does this mean that painting the truck will be twice as difficult as painting a car would be? Not really, but it could be if you don’t understand the process. At the heart of the matter is the fact that since the truck is twice the size of a car, there are more opportunities to make mistakes, which could cost you twice the amount to fix. Nevertheless, on the face of it, both vehicles are just getting a new coat of paint, right? Well, no, there is more to it than that, and to avoid mistakes, it is necessary to understand the differences between painting a small car and painting a large truck, so let’s look at some of the differences. This may sound like a self-evident truth, but the fact is that painting a truck can take more than three times the amount of time, paint, solvents, and other consumables it takes to paint a car. Therefore, the materials required to do the job can cost as much as three times what it would cost to paint a car. Since trucks are bigger than cars, the amount of time it takes to prepare the surface for painting increases in direct proportion to the difference in surface area. Assuming that all dings, dents, and rust spots have been repaired, just getting a uniformly smooth finish on a truck can take up to a week before you can apply the primer. However, if you are not painting a project vehicle that is already stripped down to its bare bones, removing all chrome embellishments, door handles, mirrors, bumpers, windows, lights, trim panels, and everything else you don’t want to paint, including the interior, can take another week. There is just no way to mask off these items successfully. Since you are in for a penny, you might as well be in for a pound, but the additional time and trouble will show in the final result. The long and short of this is that if you want a professional result, you have to use professional methods, one of which is to strip the truck down. Light is reflected differently from different surfaces, such as from the rounded surfaces of a car, as opposed to the large, relatively flat surfaces of a truck. Since the surfaces of a car are often made up of compound radii, the light that reflects off a car is reflected in many directions, which can hide differences in the depth of the color. This is not the case with trucks, since much of the light that falls on it is reflected straight back at the observer due the large, relatively flat surfaces of the doors and side panels. This makes even slight differences in the depth, or intensity of the color immediately (and glaringly) obvious. So, to avoid snarky comments about your “patchy” paint job, you need to make absolutely certain that the thickness of the paint is uniform over the entire surface area of the truck. Getting this right is not always as easy as it sounds, but we’ll talk more about that later. For now though, let us look at the type of knowledge you need to achieve a professional result. Despite the issues mentioned above, there is no need to panic, or think that you could never achieve a good paint job on your truck. 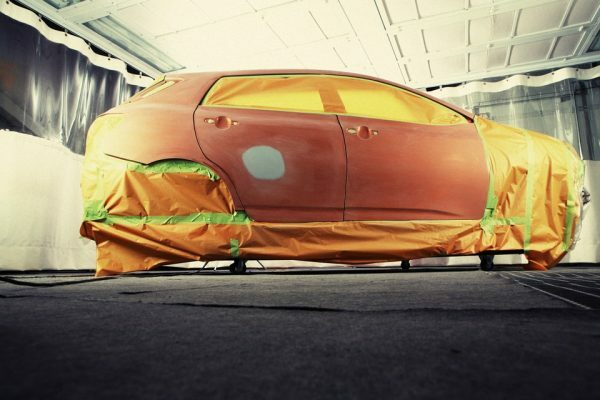 There are many online resources and tutorials available that explains the basic steps and processes involved in spray painting a vehicle, but as with so much else on the internet, some resources are better avoided. Fortunately, though, there are some online resources that stand out from the crowd, so to speak. 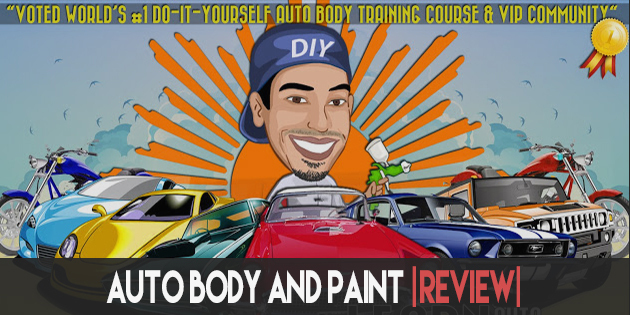 One such resource is “Learn Auto Body and Paint”, a video training course that covers all aspects of body preparation, as well as the actual process of spray painting in great depth and detail. The creator of this outstanding training course, Tony Bandalos, has been painting cars since the tender age of 12, and in the following two decades or so, he has gained a wealth of experience that he is now making available in the form of 70 hours of video tutorials, as well as articles, explanations, and other bonus material. Doing bodywork that will stand out anywhere. 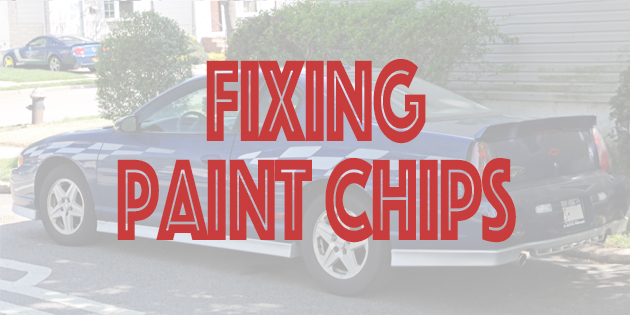 Repairing dents, dings, rust spots, and general preparation prior to painting. Masking techniques that will prevent getting overspray on anything. How to get a professional paint finish every time. The latest developments in paints, paint systems, and painting equipment. The required equipment, as well the advantages and disadvantages of different types of paints, solvents, and spray guns. Tried and tested tips, and general tricks of the spray-painting trade used by professionals. Proven ways to turn a profit with your newly-acquired skills. One more thing you need to know about this course is the fact that it is used in the curriculum of the entire Austin, TX, school district, which should tell you that this resource is several cuts above the scattered, often fragmented, incomplete, and sometimes downright useless information that is available for free on the internet today. Tony is also reachable if you need to discuss a particular issue, which is a feature not often found with other training material. Moreover, you can follow Tony on his YouTube channel, which currently has more than 30 000 subscribers from all parts of the world. So assuming that you have bought, and worked through Tony Bandalos’ excellent training material and that you have used the information to repair dents, dings, rust, and other blemishes, it is now time to move on the more practical matters. We have previously stated that painting a truck is materially different to painting a car, and we have explained some of the differences earlier. However, long experience has taught that the biggest difference lies in how you approach the job, so here are some practical tips and tricks (apart from those in Tony’s training videos) to make the job easier. While this article cannot teach you to apply spray paint professionally, it can tell you what you need to help you do that. Your first requirement will be an air compressor that can deliver enough compressed air for long enough. Air pressure is not the primary consideration when you want to paint a truck. The most important things to remember are that you need the largest possible volume of compressed air, and that you want it for the longest possible time. 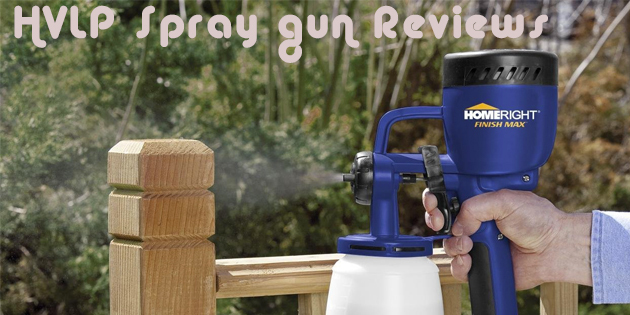 If you are using a LPHV (Low Pressure High Volume) spray gun, you only need about 4-5 PSI of pressure, but the high volume of air this type of gun requires means that you have to have a compressor that can deliver compressed air at a rate of least 20-25 CFM, or Cubic Feet per Minute for the entire time it will take to paint the truck. This can take several hours, which means that your small 10-gallon compressor just won’t cut it. NOTE: LPHV spray guns are excellent at reducing overspray, and with proper adjustment of the air flow and paint feed, overspray can be almost eliminated. What you need is a compressor with at least a 60 gallon tank fitted with a water trap, a pressure regulator the outlet and an adjustable safety valve that does not allow the pressure in the tank to fluctuate by more than about 15% or so. Most compressors in this class can easily maintain a pressure of 50-, 60PSI, which is more than adequate for your purposes. The only reason why you’d want a high pressure is because higher pressures mean that there is a larger volume of air in the tank, which is what you need to paint a large vehicle. NOTE: Most equipment hire establishments will have such a compressor available for hire, but if you decide to hire one, pay close attention to the accuracy of the pressure regulator on the outlet, and the effectiveness of the water trap. The function of the water trap is to remove moisture from the air used by the spraying equipment, and if it is not removed effectively, it can ruin your paint job. Since you will be working in an enclosed space with limited ventilation, it is crucially important that you wear a gas mask that is rated for paint and solvents. All of the different fumes you will be in close contact with are highly toxic, so take special care, and make sure that you are able to avoid inhaling any of it. NOTE: If you are planning on using extractor fans to ventilate the work area, make sure the motors are flame proofed, since the vapors from paint and solvents are highly combustible. This goes for painting cars as well, but since trucks can be twice as big as a car, air-borne dust has twice the surface area to settle on. Remember that the thickness of a dust speck will be increased by the thickness of the paint, so even if you don’t actually see dust floating about, you will certainly see dust that was trapped by the wet paint, which is the last thing you want to see. If you are going to be working in your garage, spend a few dollars on white plastic sheeting to cover the walls and ceiling to control dust. Make sure you cover as much of the walls and ceiling as you can, but take some time to make sure the sheeting is fastened properly. The last thing you want to happen is for a sheet of plastic to become undone, and fall onto the wet paint you’ve just applied. NOTE: Since you need as much light as you can get to eliminate shadows that could interfere with how you see the fresh paint, white plastic sheeting will help to reflect light evenly onto the truck. Some colors, such as blue, red, and gray are notoriously difficult to apply evenly, so if you don’t have enough illumination, hire some halogen work lights on portable stands when you hire the compressor. Also, don’t paint the truck if the weather is wet, cold, or excessively humid. 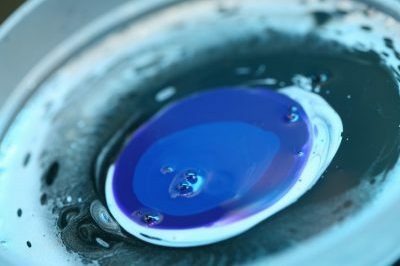 The moisture in the air coupled with low ambient temperatures can seriously affect not only the adhesion of the new paint, but also the drying, or curing time. Before you start painting, make sure that the air hose is long enough for you reach every part of the truck, and especially the roof. The last thing you want to have happen is for the hose to touch, or worse, drag along a newly-painted part of the truck. Repairing this type of damage is time consuming, difficult, and costly, so make sure it cannot happen. If needs be, buy a small step ladder to reach the roof, and get an assistant to help you keep the air hose away from the body work. 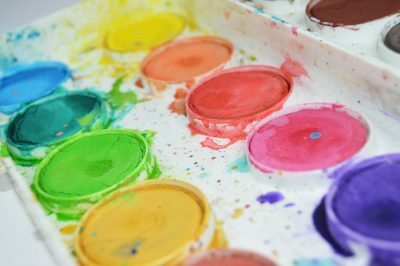 When you start painting, you need to be sure that you have at least three to four hours available during which you will not be disturbed or distracted. 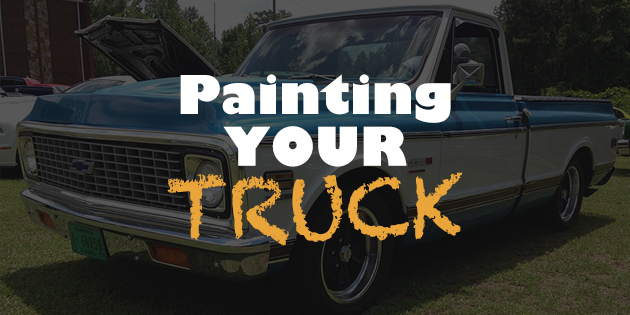 To get a professional result, you need to paint the truck in one, uninterrupted procedure, so make sure you have enough time, paint, and everything else you need to get the job done in one go. Unless you are a skilled spray painter, do NOT try to cover the truck with one or two coats. The wet paint on the large, flat surfaces along the sides will almost certainly run, sag, or crease, which if it happens, means you will have to remove that paint and start over. If you are not experienced in spray painting, paint the truck with at least four or five light coats, and be sure to apply the paint in several directions to ensure even coverage. If you have enough illumination, you will be able to see where the paint is not of an even thickness, so with the next pass, concentrate on those areas. By the fourth coat, the paint coat should have an even thickness, and there should not be any areas that are noticeably different in color depth or intensity. However, before you apply the final color coat, spend a few minutes checking the evenness of the color with the aid of a strong halogen light, but do so before the last coat has had time to dry completely. Touch up any areas that appear lighter or not of the same color depth before applying the final coat. Considering the fact that you have just spent several thousand dollars painting your truck, allowing the paint to cure for seven to ten days before you start assembling the truck is a small price to pay. In an ideal world, where every DIY spray painter had a proper spray booth and curing oven that cures paint in 20 minutes, everyone could do a job like this in a weekend. Sadly though, we don’t live in an ideal world, so no matter how strong the temptation gets, resist the urge to touch the paint to see how hard it is. Even under the most favorable conditions, the paint won’t be hard enough to resist damage before at least seven days had passed, so do yourself a favor and leave it alone, unless you want to spend another few hundred dollars repainting half the truck to remove finger imprints.